My client had a tabletop, provided a set of turned legs, and I made the skirt. It’s best to use hardwood for the skirt. 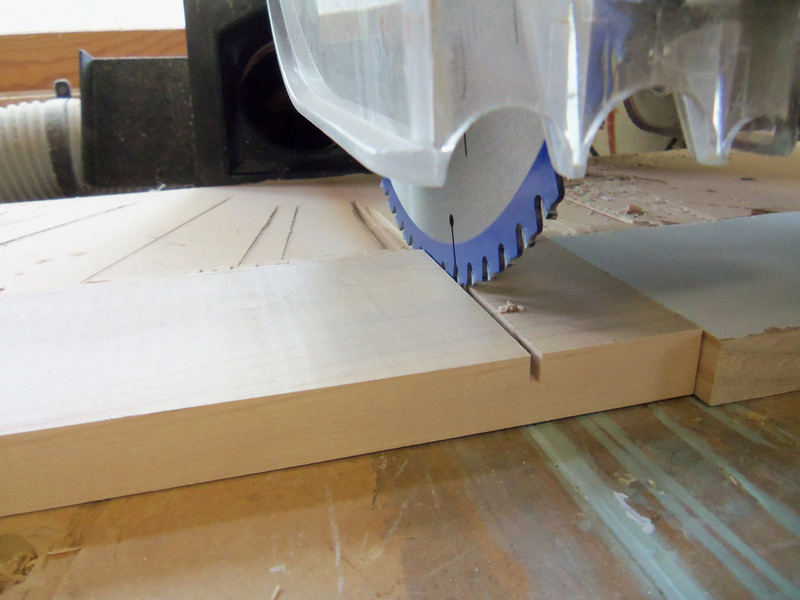 I ripped and planed 4 maple boards to 3 1/2″ width, straight and true. 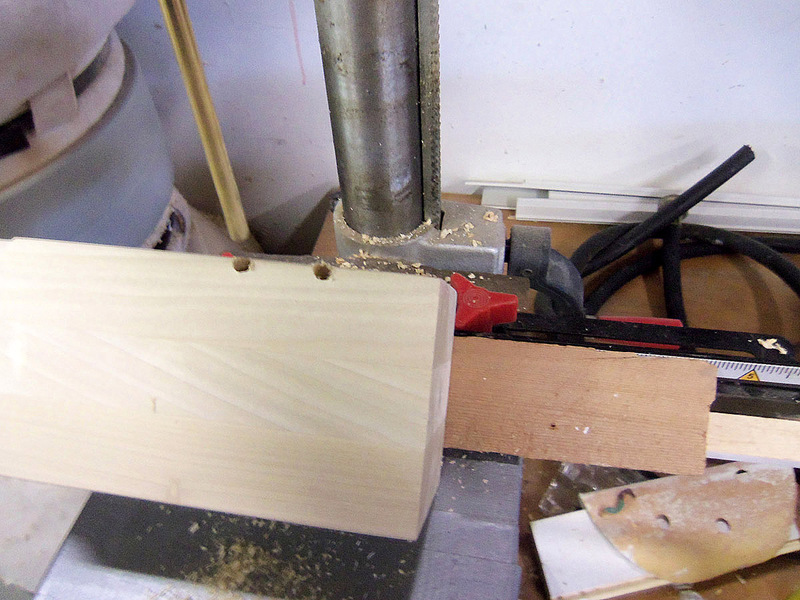 The I set a stop block (white) on my radial arm saw and raised the blade so that it would cut a kerf 1/4″ deep for the shoulder of the kerf-mount apron brackets, 1 7/8″ from each end of all four boards. If you don’t have a radial arm saw, you can do the same thing upside down with a table saw and fence. 3″ X 4-3/4″ kerf-mount corner bracket, set of 4. Make sure to get the kerf-mount type, which are much stronger than brackets that are attached only with screws. I placed the shoulders of the kerf-mount apron brackets in the slots and marked the holes in the metal brackets. 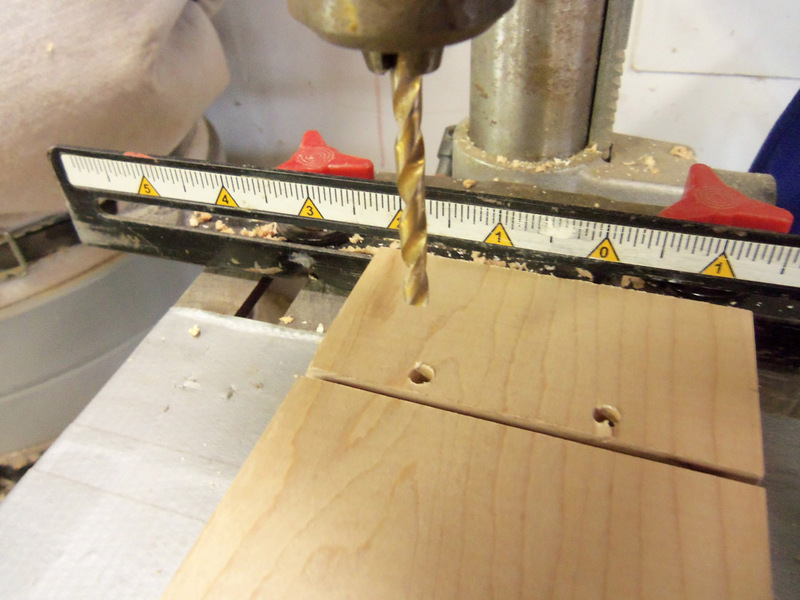 Then I used the drill press to create 5/8″ deep holes for the 3/4″ screws. 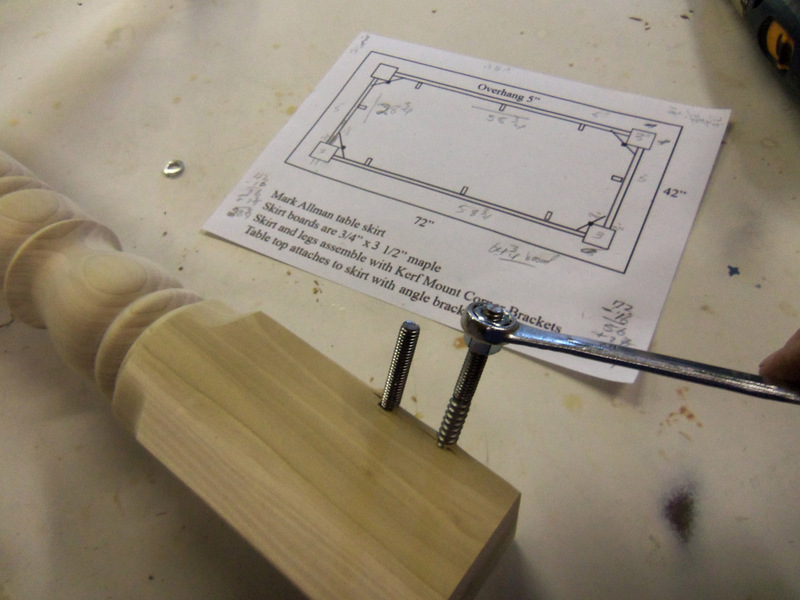 If you don’t have a drill press, you can use a hand-held drill. Wrap a piece of tape around the drill bit at 5/8″ to show you the depth. Don’t drill all the way through! After centering and attaching all four corner leg brackets to the apron boards, I marked the locations of the leg screws. 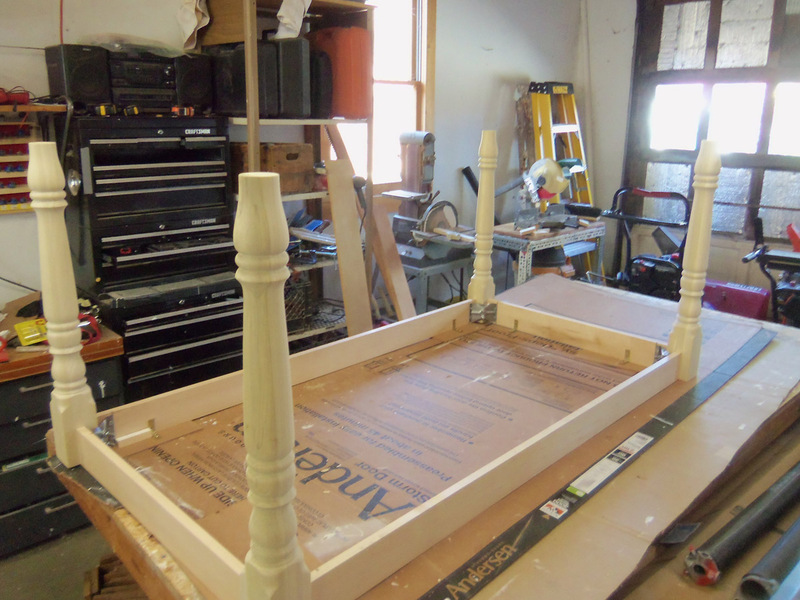 Make sure the legs and apron boards are sitting flush to the work surface. To accurately drill the holes for the wood screw end of the hanger bolts, I attached a piece of wood cut at a 45 degree angle to the fence of my drill press, and held the table leg tight to it. It is important that the location and angle of the holes be precise. 5/16″ -18 x 3″ hanger bolts, 8 pack One end of the bolt screws into the legs, and the other end goes through the metal bracket. Screw the hanger bolts into the corner of the leg tops by tightening two 5/16″ nuts to each other. Turn the bolts until only the machine screw threads are exposed. Separate the nuts and remove. Never use pliers, which would ruin the threads. 5/16-18 zinc-coated hex nuts for attaching the hanger bolts. 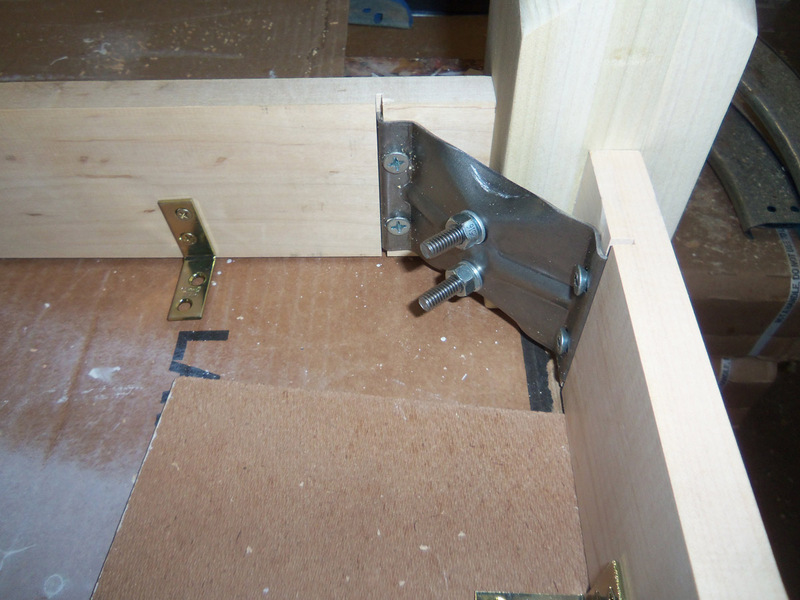 Attach the kerf brackets to the skirt with 3/4″ wood screws. Pull the table leg tight to the skirt by inserting the hanger bolts into the bracket and tightening. The 1 7/8″ distance from the end of the board to the kerf was exactly the right amount to center the skirt boards on the leg and pull the leg tight to the bracket. 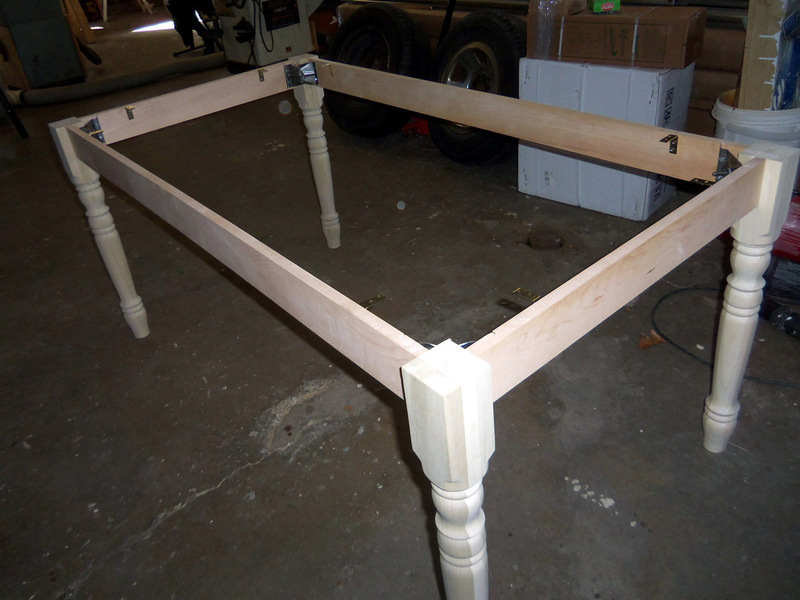 I will use 1 1/2″ corner braces to attach the tabletop, which is made of veneered MDF fiberboard. If you are securing a tabletop made of real wood boards, fixing the top tightly to the apron may cause it to split due to contraction and expansion. Instead, use wood blocks or Table Top Fasteners that are designed to fit into a slot in the skirt.